Kidney stones (calculi) are hardened mineral deposits that form in the kidney. They originate as microscopic particles or crystals and develop into stones over time. The medical term for this condition is nephrolithiasis, or renal stone disease. Kidney stones usually do not have a single cause, but form when there are high amounts of crystal-forming minerals, such as calcium, uric acid, or oxalate, in the urine. A kidney stone environment is likely to develop if these substances are not properly diluted by the urine. There are many types of kidney stones, however, the most common type is the calcium stone which is caused by dietary factors. Other kidney stone types like struvite stones form in response to an infection, such as a urinary tract infection (UTI). Treatment depends on the size and type of stone, the underlying cause, the presence of any urinary infection, and whether the condition recurs. Stones 4 mm and smaller (less than 1/4 inch in diameter) pass without intervention in 90% of cases; those 5–7 mm do so in 50% of cases; and those larger than 7 mm rarely pass without a surgical procedure. Patients are advised to avoid becoming too sedentary, because physical activity, especially walking, can help move a stone. Advuro surgeons remove kidney stones through endoscopy rather than open surgery. A special long, thin telescopic instrument is inserted through the urethra and passed through the bladder and up the ureter to the stone. Once the stone is located, the urologist either removes it with a small basket inserted through the ureteroscope (called basket extraction) or breaks up the stone with a laser or similar device. The fragments are then passed by the patient. Ureteroscopy is performed under general or regional anesthesia on an outpatient basis. Benefits: Open surgery would require prolonged hospitalization, and recovery takes several weeks. Endoscopic kidney stone removal has a much faster recovery time and is minimally invasive, which means less pain and a quicker recovery. 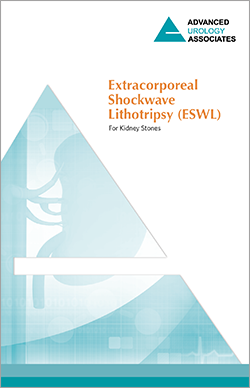 Extracorporeal Shockwave Lithotripsy (ESWL or SWL) is a non-surgical technique used for treating kidney stones. The procedure is pain-free and should only take about 45 minutes to 1 hour. By using high energy shock waves, kidney stones can be targeted and broken into tiny pieces. By fragmenting the stones, the patient will have any easier and less painful time passing them through the kidney and bladder. After the procedure, the tiny pieces of stones will pass out of the body through the patient’s urine. Benefits: Open surgery would require prolonged hospitalization, and recovery takes several weeks. Endoscopic kidney stone removal has a much faster recovery time and is minimally invasive, which means less pain and a quicker recovery. Questions About Urinary Tract Stones (Calculi)? If you any have questions about Urinary Tract Stones (Calculi), contact our adult urology experts at Advanced Urology Associates at 815.409.4930 or request an appointment.